Linda Hohag has created her first children’s collection (Little Bear Counts) and it is so cute! The counting blocks in the main panel can be used as a panel or cut up. There are individual numbers at the top and bottom of the panel as well. The motifs in the blocks are reflected in the supporting pieces. A running stripe can be cut in a variety of widths to use as borders or sashing. 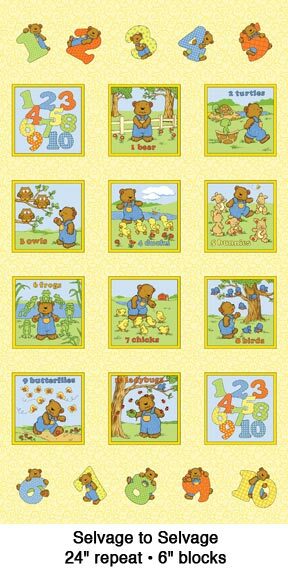 The go-withs include tossed bears and numbers, stars, daisies and a tonal scroll. This is a very coordinated collection that works for either gender. This entry was posted on Sunday, December 12th, 2010 at 1:00 am and is filed under Uncategorized. You can follow any responses to this entry through the RSS 2.0 feed. You can leave a response, or trackback from your own site.